(24-pack bulk quantity) The toggled E-series 16-watt linear LED tube light bulb is designed to replace T8/T12 fluorescent tube lights to significantly lower energy and maintenance costs while enhancing the quality of light in work environments and living spaces. The lighting optimized triangular tube shape is specifically engineered for a broader and more uniform light distribution with sufficient back lighting to eliminate the "cave" effect in troffers. This next generation LED lighting technology is a popular choice for environments with 120-277 VAC power including commercial / industrial environments, retail stores, healthcare facilities, warehouses, schools / gymnasiums, garages, basements and similar lighting applications. Ideal for recessed troffers, wrap fixtures, under cabinet fixtures, sealed fixtures, deep cell troffers and strip/shop fixtures. Following a simple retrofit process to bypass the ballast system, toggled LED tubes work within existing fluorescent light fixtures offering the additional benefits of eliminating ballast replacement costs, buzz noise and light flicker. 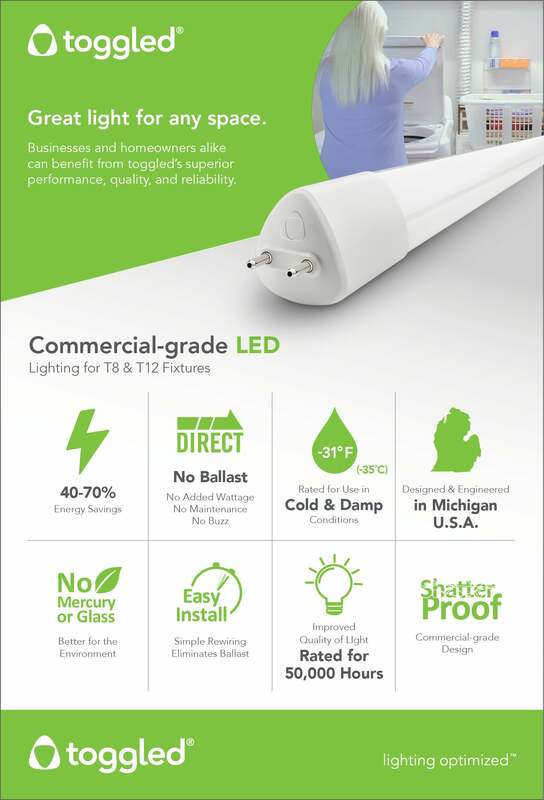 Designed and engineered in Troy, Michigan U.S.A., toggled's patented, commercial-grade LED tube design uses less energy than traditional fluorescent tubes and is rated for 50,000 hours with a 6-year *limited commercial warranty (*Limited lifetime residential warranty). Save Energy, Save Money: Cut lighting energy costs by 40-70% over fluorescent lighting. Energy credit (rebate) eligible. Bypass the Ballast and Hassle: Eliminate ballast energy use, noise, flicker, failure and replacement costs. Simple rewiring required (minutes), step-by-step instructions. Designed & Engineered in U.S.A.: Headquartered in Troy Mich., toggled is at the forefront of highly engineered LED lighting with 80+ patents. Indoor & Damp Environments/Cold Instant Start: Offices, healthcare, industrial, retail, schools, refrigeration, warehouses, kitchens, basements, garages, outbuildings.